While the iOS App Store is very strict regarding the quality and security of the apps they allow, not all of them deliver. Tapping on a touch screen is easy and so is buying an app by accident. If this happened to you, it is possible to refund an accidentally purchased iOS app. Regardless of your reason, Apple gives us the option to ask for a refund. Maybe you bought an app or a game by accident or it’s just not what you were looking for. Either way, refunding an iOS app is a simple process. Before anything else, you will need to open the accidentally purchased app and allow it to load. If you’ve already done this, you can skip this step. It only needs to be done once. Then, open Apple’s Report A Problem web page in your browser and sign in with your Apple ID. It’s worth noting this should be the same Apple ID you used when you bought the app. Navigate to the Apps tab, locate the app in the list and click the “Report a problem” option next to it. Keep in mind that if you do this while the app is still downloading and installing, you might not see the app listed. You will need to wait for the purchased app to install, launch it, and keep it open for a few minutes. Then, check the app list again and it should be there. 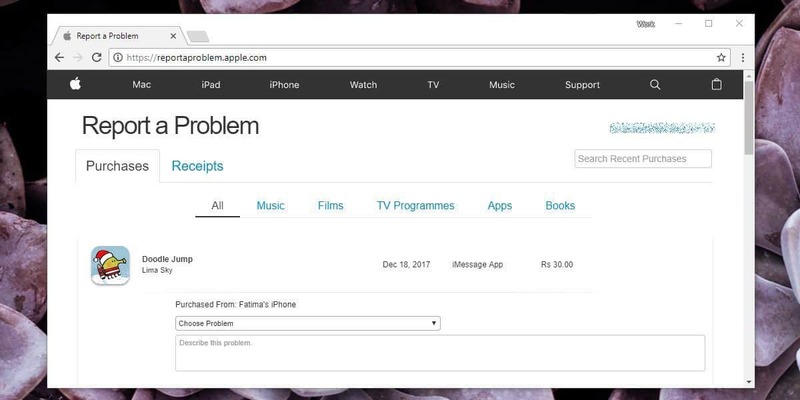 After you select the “Report a problem” option, a drop-down menu will appear, which you can use to describe the problem. For the purpose of our guide, select the option called “Didn’t mean to purchase this item”. Enter a phrase describing the problem using similar wording in the text box below and click the Submit button. Apple will analyze your request and should they accept it, you will get the refund within 7 working days at the most. 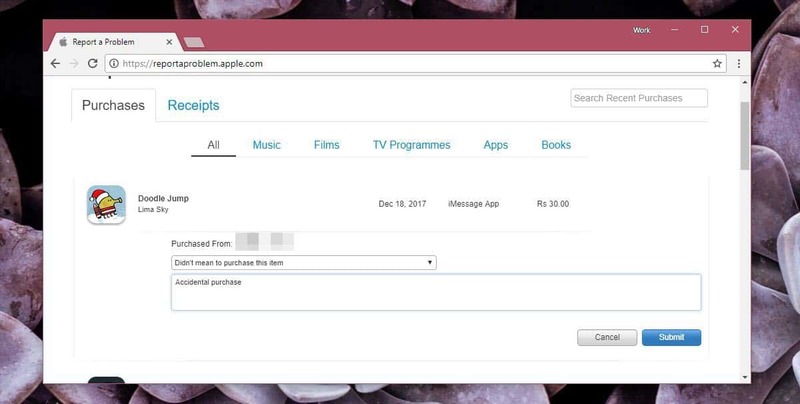 Technically, anyone can try to refund an accidentally purchased iOS app. Practically, it should be done as soon as possible after the purchase. As you might suspect, there are quite a few people trying to cheat the system – they buy an app or a game, use it for days or even weeks and then try to get a refund. It quite obvious Apple is very strict when it comes to these things, so if you don’t take action quickly enough you might not get your money back. Also, refunding multiple apps at once can be tricky. I mean, how many apps can someone purchase by accident one after another? There are special cases, however, such as kids using their parents’ devices. In this case, the better solution would be talking to the Apple chat support. You should also know you can’t refund an app you’ve gifted. 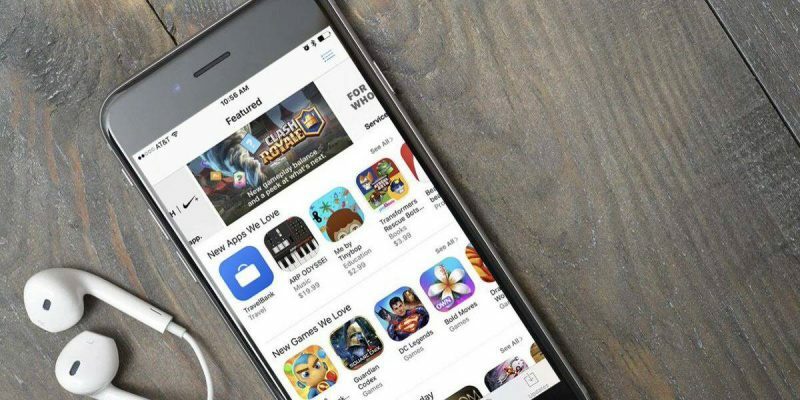 Did you ever buy an iOS app by accident and have you managed to get a refund?